One of the greatest artistic masterpieces not only for the city of Arezzo, but for the whole of Tuscany, is located behind the magnificent crucifix of the 13th century that is hung above the high altar of the Basilica of Saint Francis in Arezzo: it is the Bacci Chapel, decorated with Piero della Francesca's frescos. These paintings, completed between 1452 and 1466 by the great Master from Biturgi, illustrate the "Legend of the True Cross" as it was narrated in the 13th century by the Dominican friar Jacopo da Varagine in his "Legenda Aurea". 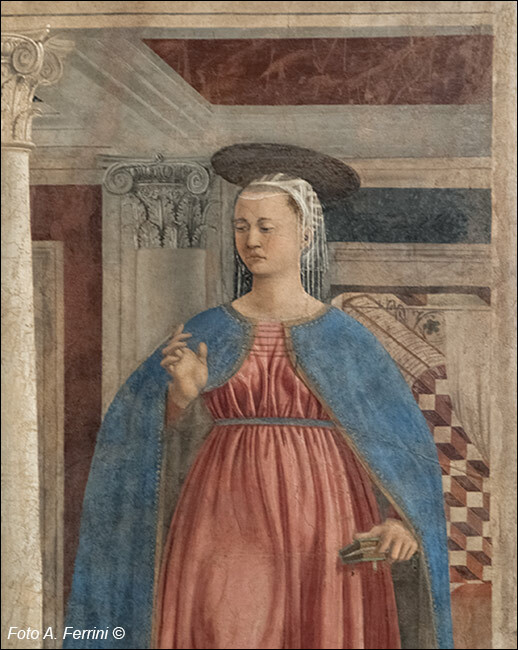 Piero della Francesca, who's first name was Piero di Benedetto dei Franceschini, was born in Sansepolcro around 1415. In this same Village of the Tiberina Valley he died after having spent his last years in total blindness on the 12th of October 1492, day of the discovery of America. He received his first painting lessons at Antonio d'Anghiari's workshop, a painter of a not-too-high quality. 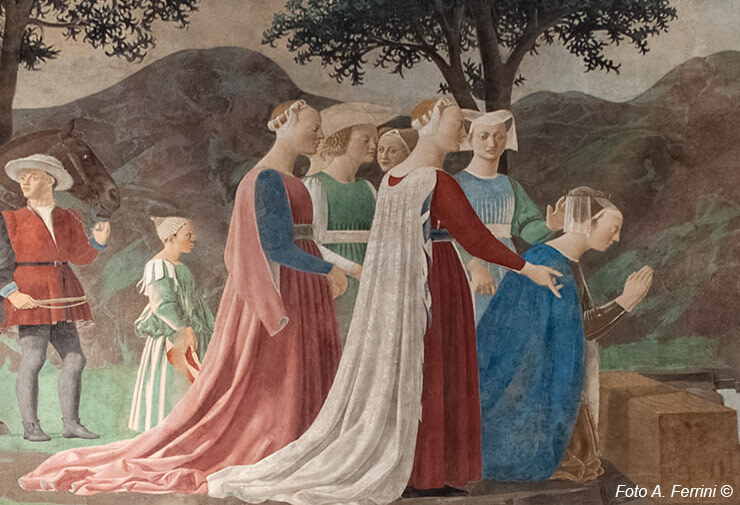 After moving to Florence, Piero della Francesca developed his artistic formation at Domenico Veneziano's workshop. This was happening in the 1430s, very meaningful years for the Florentine pictorial art because they were influenced by the great technical and expressive innovations that had been brought during the previous decade by Tommaso Cassai from San Giovanni Valdarno, also known as "Tommasaccio" due to his restlessness youth, and then Masaccio in art. After his fundamental experience in Florence, Piero della Francesca developed relationships with several courts of Central Italy. This led him to work in Ferrara, Rimini and Urbino (during 1460s and 1470s) for the the court of Duke Federico II from Montefeltro. The Duke and his wife Battista Sforza's profiles created by the painter from Biturgi are particularly known, and are nowadays kept in the Uffizi Gallery in Florence. As already said, Piero della Francesca worked in important courts of Central Italy, but he always remained attached to the land of Arezzo. During 1450s and 1460s the painter was particularly active in his native city of Sansepolcro, in the nearby Monterchi, his mother's native village where he painted the famous Madonna del Parto, and in Arezzo where he painted a fresco with Maria Maddalena inside the Duomo and the great decoration of the Church of Saint Francis main chapel, which took almost fourteen years to complete. This chapel took the name Bacci from the wealthy family of merchants from Arezzo who had commisioned the work and that, having their palace just a few steps away from the Franciscan church (today's corner between Via Cavour and Corso Italia) , connected them to this place of worship, which was already of high artistic value in Piero's time because it had been frescoed for a few years in many of its parts by famous artists from Arezzo and other cities, primarily Spinello Aretino. Piero della Francesca's decoration of the Bacci Chapel was the continuation of the previous work that the old Florentine painter Bicci di Lorenzo, who was still expressing his art in a late Gothic style, had started in 1447, still on the Bacci's commission. Bicci di Lorenzo died in 1452, after having finished only the first vault where he had painted the four evangelists. In that same year, Pier della Francesca took over the work. It could well be affirmed that the Florentine painter's death was fortunate for the future artistic value of the Church of Saint Francis and the city of Arezzo.